A new application report describes how the CASY is successfully used in Tübingen, Germany to test new polychemotherapy regimens with growth inhibition assays. Aim of the studies * was, to generate new and more effective chemotherapy regimens. 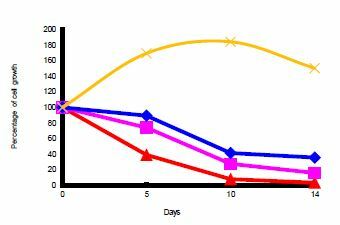 The CASY was utilized to evaluate the growth inhibition of the regimens in cell culture quickly, simple and reliable. Read the Application report. And here find the original publication. *: Weinreich J, Archid R, Bajaeifer K, Hack A, Königsrainer A, Schott TC. Growth and Chemosensitivity of Gastric Adenocarcinoma and Non-Malignant Cell Lines in Response to Novel Anti-Cancer Drug Combinations. Chemotherapy. 2014; 60(5-6):346-352. DOI: 10.1159/000438943. Epub 2015 Aug 29.